The True Love Bouquet is full of romantic sentiment and dreams for the years ahead. 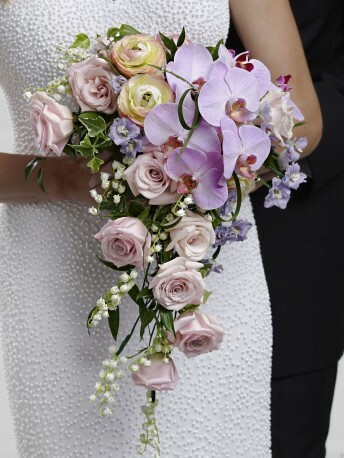 Pink roses, pink ranunculus, lavender larkspur, lavender phalaenopsis orchids, lily of the valley, variegated ivy, lily grass blades and lush greens are beautifully arranged in a teardrop shape to create the bouquet that exudes a soft sophistication. Approx. 17"H x 23"W.